The E-Team is very excited to host a final birthday bash to celebrate Operation Write Home. Here's my card for this birthday bash. Knowing I wanted to make multiple cards in one sitting, I went for plain white cardstock and decided to use one ink color. I needed simple and did not want to spend time coloring. I chose this outline Unity stamp design because it felt like the right one to use. I had to remember that I was making cards to send to our military overseas so that they would have a card to send back home to their loved ones. Can't you just picture a soldier using this card to write to his/her sweetheart? 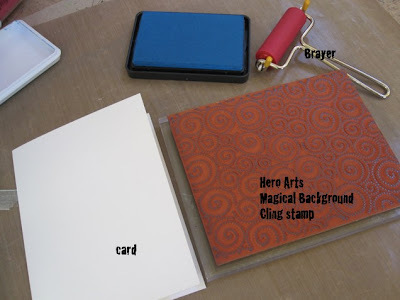 Instead of using colored cardstock or designer paper for a mat, I reached for a Hero Arts large cling mount stamp. The Hero Arts large cling mount stamps cover an entire A2 size cardfront. I chose a design that would go with the single Unity design and knew it would look good with one color. Having the right tools really does make a difference in being able to accomplish the task. The new Fiskars 9" trimmer is really made for cardmakers. It has a wire cut line to help guide you. I simply cut my cardstock in half so I could get two cards per 1 sheet of 8-1/2 x 11 cardstock. The Scor-Buddy if the perfect size for cardmakers, too, and oh so cute. 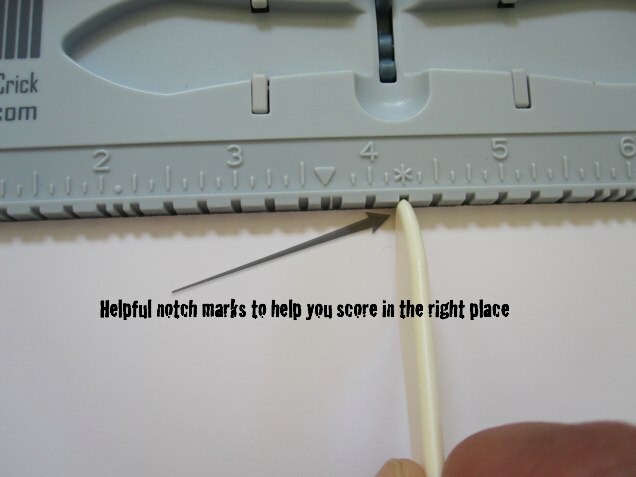 There are notches to help you with folds and also comes with it's bone folder which makes for perfect creases. When inking up a large surface like the front of an entire card front, the best way I have found to do so is to ink the stamp, then place your cardstock on top of the stamp. 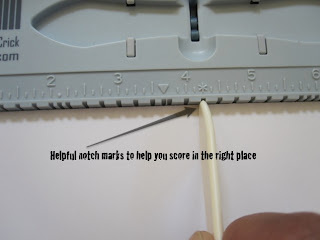 Laying a piece of scrap paper on top of the cardstock will help prevent any smudges. Another big tip I've learned, use a brayer to get an even stamped image. Next I reached for my Fiskars Stamp Press. 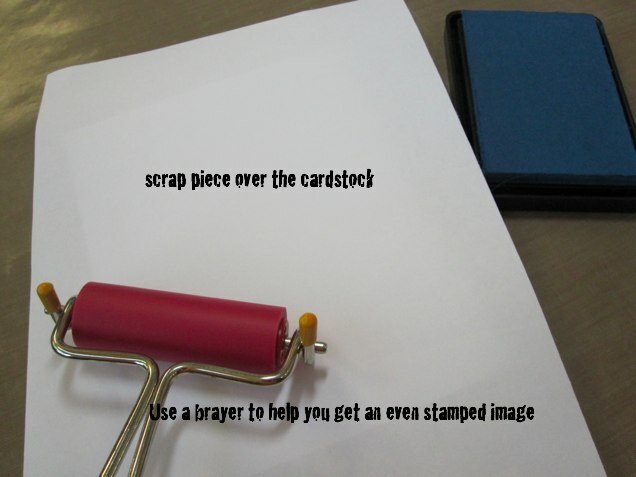 It really helps you get that even stamped image. 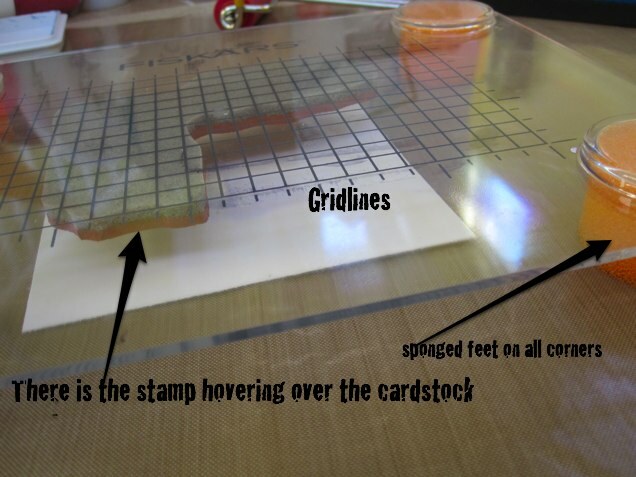 Two of its best features, 1) there are gridlines and 2) It has 4 corners sponged feet you can actually lay it over your cardstock to help figure out where to stamp your image....and press to stamp. 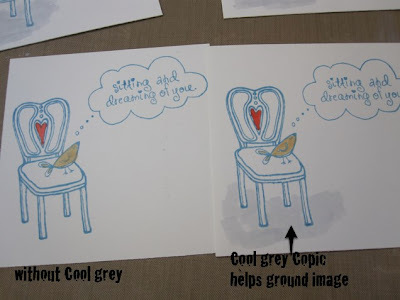 Another tip I have learned is to use specific Copic Colors for helping to "ground" your image...so it's not just floating. 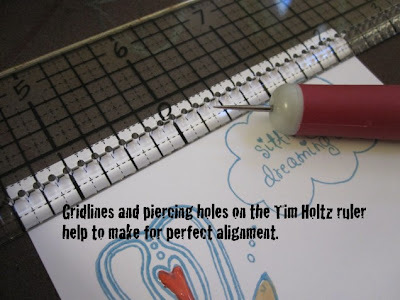 Just to add some dimension without adding bulk, I reached for my Craft Pick and Tim Holtz Ruler. The paper piercing echoed the Magical Background Hero Arts stamp( this background stamp can be so versatile). Having the right tools can really help with it comes to creating and assembling cards in mass production mode. I did add some red for some color. Some ribbon attached with mini staples from the Tiny Attacher and it was a simple card, easy to duplicate for multiples, and one that I am sending off to Operation Write Home. Please join The E-Team in creating and sending cards to Operation Write Home. You can read about the Operation Write Home guidelines HERE. Visit the E-Team to get more tips and tricks creating multiple cards. Everyone has a sample and some helpful hints when it comes to cardmaking. 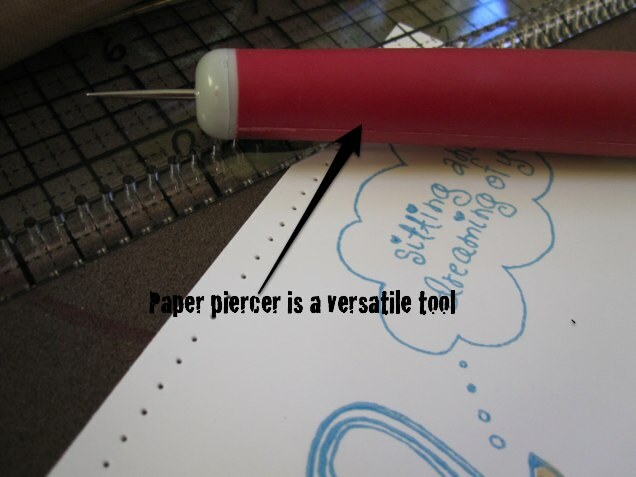 Visit each blog, leave a comment and you'll get a chance to win some paper crafting goodies. Upload your card creation to eclectic Paperie Flickr Group by Sunday, Oct 3rd for a chance to win 1 of 2 eclectic Paperie box of goodies. eclectic Paperie has a special coupon code to offer some savings in order to stock up on favorite tools, papers, stamps, and all things paper crafts. Use coupon code OWHCARDS and you will receive 10% off your entire order (min $10 order) at eclectic Paperie. The coupon code is good Saturday, September 25th thru Sunday October 3rd. Yes, the coupon code is good through World Card Making day! Leave a comment here and you can win the Hero Arts Magical Background stamp plus some extra Hero Arts ribbons. Happy Birthday, Operation Write Home! 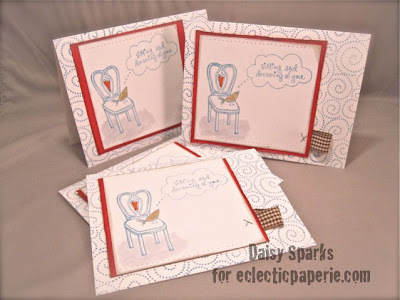 What a fun card to make and I love your tutorial, Daisy!! Great card and great tips!! TFS!! and inspiring! thanks for all the wonderful tips for making this cards in large numbers! The example card was great! GREAT idea - definitely going to be trying some new tools, thanks Daisy! 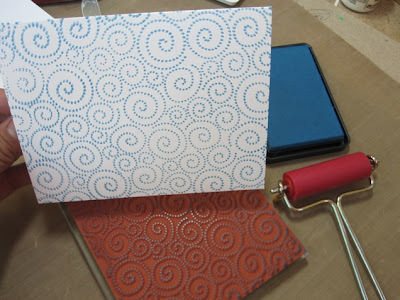 Love my stamp press! 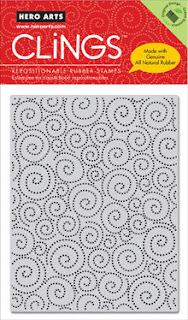 I use it for backgrounds and large images as they stamp perfect every time. Cute cards! great card - love the background! Thanks for sharing your tips! What a great card. I am so glad you ladies are doing this. And especially glad that you all are giving us directions on your beautiful creations--bonus!! Lovely cards! Thanks very much for the tutorial... I love the pierced holes along the top for added interest. Great idea! Thanks for your tutorial. I really like your card and tips since I usually do bulk cards for OWH. TFS and supporting OWH. Darling card... great for OWH! Thanks for the tips you shared with us! You mentioned a number of "must haves" that I need to put on my list. Great Article. Pretty card and great tips! Perfect stamp choices! So useful for the troops overseas. Thanks so much for the chance to win! Thank you for celebrating OWH and having all these Giveaways... wish me luck! Simple but very sweet. Your card is very nice and will definitely be used. I'll be back when I've more time to really look around. I appreciate all the tips that you shared and really love your card as well! love your card and you know me....totally agree with the "It's all about the tools" :-). Love the red heart! It is just the right amount to create that 'pop'. 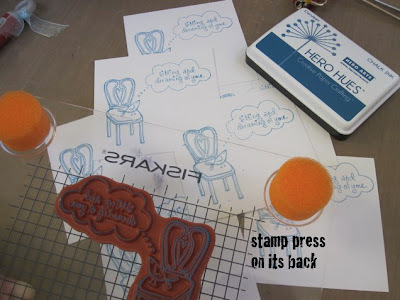 Love it and this was so much fun and I totally agree about using a brayer to ink up large stamps! Lots of great tips. Thanks! love that swirly background stamp! using different colors of paper and inks, this swirly could help to celebrate anything! thank you for the tip about "grounding" the image. Nice card! Thanks for the good tips for producing a lot of clean and simple cards. OWH is sucg an awesome organization! This is very cute, thanks for the tips! love that chair - some soldiers will love sending these cards home - thanks for supporting OWH. TFS lots of great tips and tools! They are going in my good idea box! Thanks for all the ideas and also for showing all the tools that you use. Most of all thanks for supporting OWH! It is a pleasure to meet you, Daisy. Your card is really nice! Thanks, too, for helping with such a worthy cause! Great Card...great technique...and best of all...great cause. We're doing our group get-together tomorrow. We've been doing get-togethers for about a year...I love our time together creating for a cause.